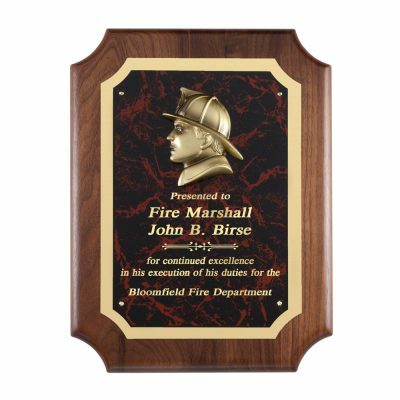 Personalize this 9″x12″ Red Marble plate with Fireman Head Resin Casting Plaque to honor our hardworking firefighters. It has a large mounted bronze casting of a fireman head and room for your customized message and artwork. You can add up to 9 lines of type to make this the perfect award for your fellow firefighter. Price includes item, basic artwork and text.